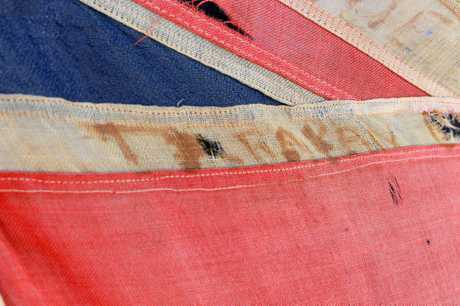 IT wasn't until Ken Ashton saw the word 'Tarakan' written in red on a faded union jack that he realised he was holding in his hands a lost national treasure. 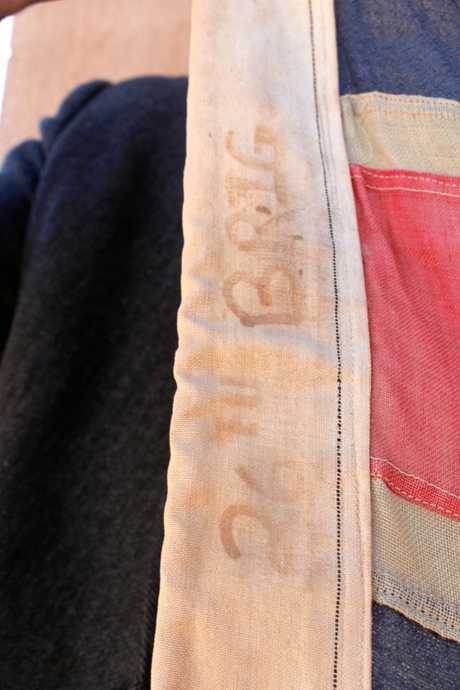 Frayed and inscribed using what is believed to be human blood, the flag showed up in Warwick yesterday after it was previously thought to be lost. 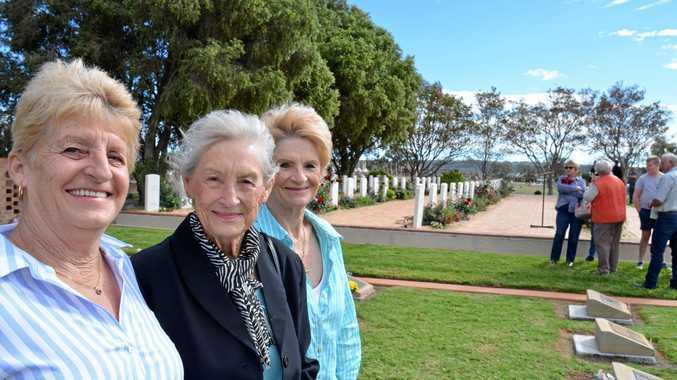 "It's incredible, I can't believe something like this still exists," Mr Ashton said. President of the newly-formed Southern Downs Ex-Service Association, Mr Ashton spends his time surrounded by hundreds of flags that hang in the SDESA headquarters on Tooth St. But this one, brought to Warwick by Australian Flag Society national convenor Nigel Morris, was particularly special. It is the very flag that was raised on the shores of Tarakan Island off the coast of Borneo on May 1, 1945, on the first day of Operation Oboe One. "It should really be hanging behind glass," Mr Ashton said. Mr Morris became acquainted with the historic flag through old photographs used in the Australian Flag Society's campaign to reintroduce a pause for the national salute in Australian schools. Since the start of the year, the AFS has been lobbying schools in Warwick and the rest of the country to implement the old tradition in which students recite the words of the Australian national salute on National Flag Day, September 3. But six months into the campaign, an interesting message came through on the AFS social media account. 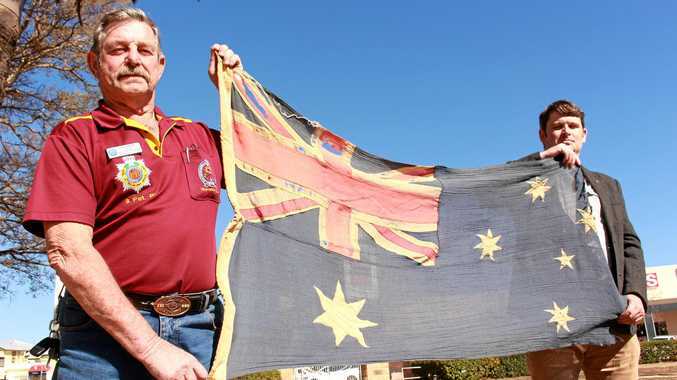 A man who claimed to have the original flag offered to send it to the society. 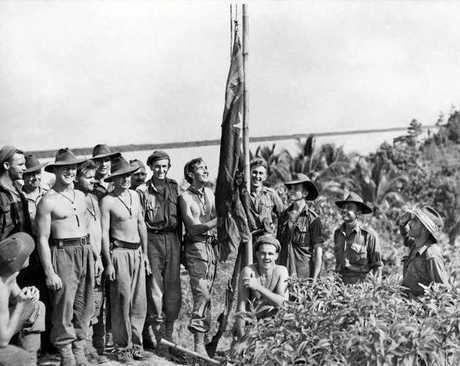 From Ipswich, the anonymous donor said his uncle won the flag off an Australian commando in a card game after the battle of Tarakan. The flag then reportedly hung in a shed for decades, where the donor remembers seeing it as a kid. Inspecting the military relic, Mr Morris said he believed it was genuine. "I am fairly knowledgeable about these things and I see a lot of similarities and no dissimilarities," he said. The flag features the words 'Tarakan', 'Lingkas Beach' and '2nd/23rd battalion'.